Ever wonder the best way to go about planting potatoes in a raised garden bed? Here is a solution that I’ve come up with over the years for a simple, easy way to get the most from your potato harvest. 1) In planting potatoes, the smaller and the larger are opposites. It means that the smaller the potato that is planted, the bigger potatoes it will grow. And the larger potato will grow more amounts of smaller potatoes. 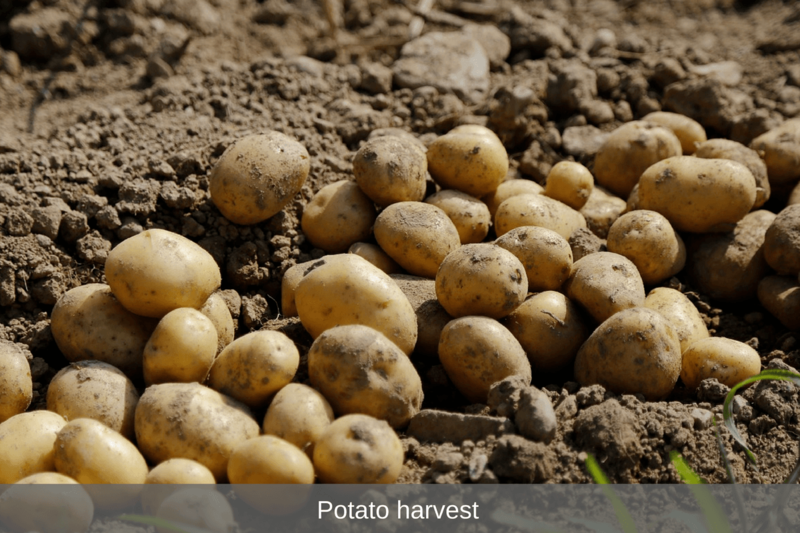 That is why people take a larger potato and cut it into pieces (each piece with an eye on it) let it sit in a dry place for 24-48 hours before planting and then put it into the ground. So they get lots of smaller size potatoes. 2) The closer you plant together, the smaller the potatoes will be. So if you want those small potatoes that you see in the grocery store that are perfect for the roasting pan, plant about 6-8 inches apart. 3) Did you know that in most cases (there are always exceptions to the rules) that potatoes usually only produce 8 inches under the soil? Which mean that if you plant a potato more than 8-12 inches that you are only going to get 8-12 inches of production. So if you have purchased a potato box or are growing in a barrel or something of the sort where they say you can get 100 pounds from it, it might not be happening for you. No matter how high you fill it up, you will only get potatoes on the first 8-12 inches. If your potatoes are already chitting (sprouting occurring on a tuber) don’t break them off if you are going to plant them. If the tubers are broken off they will not regrow. 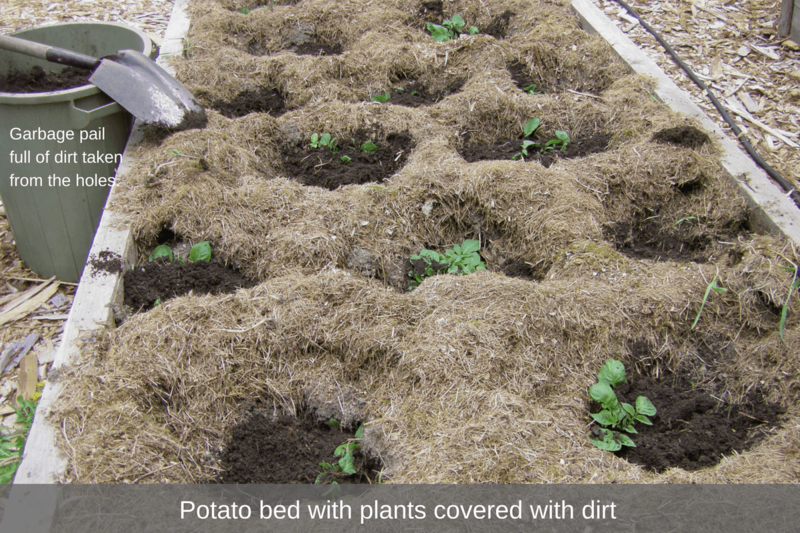 Okay… enough with the facts, here’s how I plant my potatoes in raised beds. I am actually lucky in this department as I still have potatoes left over from last year and they are sprouting like crazy. I didn’t know about the fact that small breeds larger potatoes, so I only planted small whole ones. Seemed easier than cutting the big ones, so we’ll see how that goes. I’m learning along with you as I do research for articles. If you don’t have potatoes yet I would advise buying from a reliable organic source and wouldn’t plant the ones from a grocery store. You might already buy organic ones and they should work just fine, but regular store bought potatoes are not and you might be introducing some interesting unwanted chemicals into your garden. Prepare your garden for planting. Last fall I planted winter rye in all my raised beds and on the potato bed I cut it down, turn it over a few time and planted. You can read all about using winter rye and preparing the soil in a previous article so I won’t go into much detail here. Yes, you can laugh, but it’s all about the hole. This is the secret sauce to planting in a raised bed. 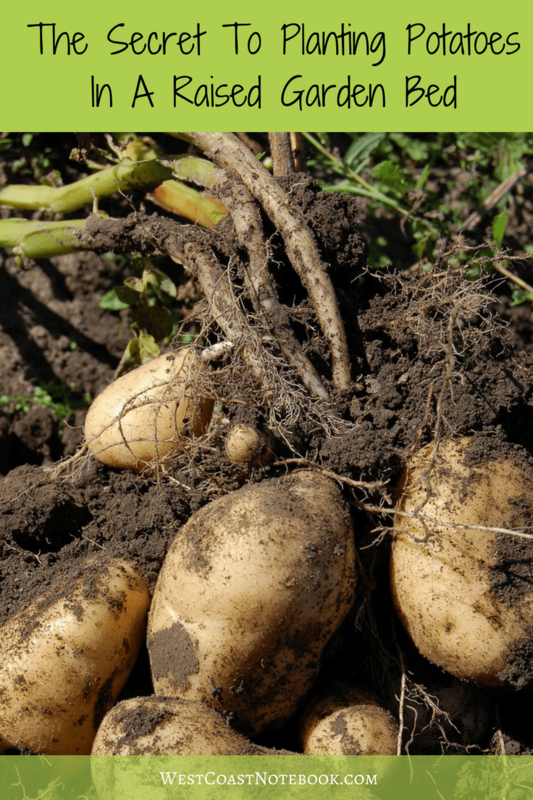 If you have ever planted in a raised bed you will know that there is only a limited amount of dirt to work with and potatoes require hilling in order to get the most production. So… where do you get that extra dirt from to hill them with? Most people did a hole or trench just deep enough to cover the potato and the tubers growing out of it. I dig a hole. We are talking a 15″ to 20″ depending on the depth of your raised bed. Then taking the dirt that I dug out of the hole it is put it into garbage cans to be used later. I put the potato at the bottom of the hole and place compost on top and wait for it to grow. The depth of the hole is perfect for two reasons. It allows me to deeply water the potatoes as they are growing. I just fill the hole up to the top and it slowly seeps into the surrounding soil. As the potatoes find their way out of the hole, I take the saved dirt in the garbage cans and add it to the top. It’s like an inverted hilling method. All they need is a little green out the top in order to keep growing up. This way, by the time the hole is filled you still have the same amount of dirt in the raised bed and your potatoes, are hilled underground. 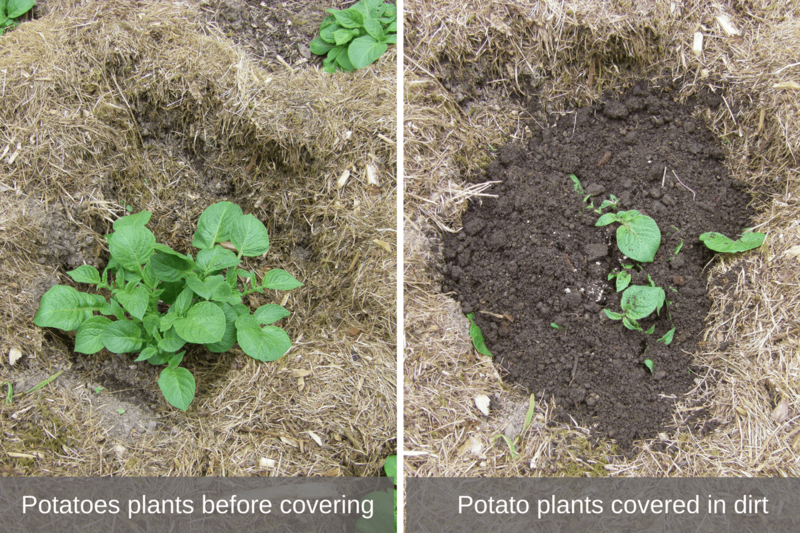 A simple and easy solution for planting potatoes. I’ve grown potatoes this way for a couple of years and have been getting high yields from each digging. Yes, you have to dig, but it’s just a matter of putting a garden fork into the soil alongside the plant and raising it up. 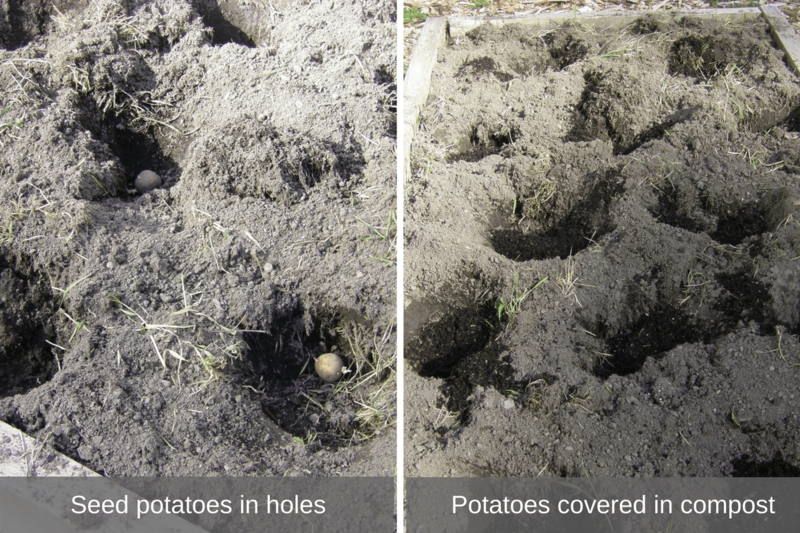 The soil is usually soft and the potatoes are contained in one spot. There is nothing more satisfying than digging a potato out of the ground. I can get 2 crops and last year I got even three as I left some in the bed for the winter. It was exceptionally cold here on the west coast and we got a lot of freezing and the garden beds were frozen solid. When they did thaw, I dug up some potatoes and carrots that were overwintering and they were both crisp, plentiful and flavourful. 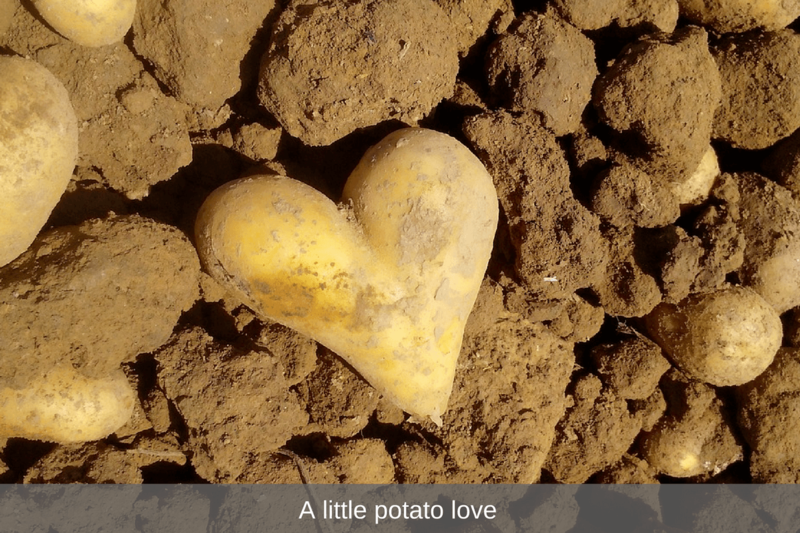 Here is sending you a little potato love for your garden this year.